Synchronicity has a dictionary definition as being “the simultaneous occurrence of events that appear significantly related but have no discernible causal connection”. 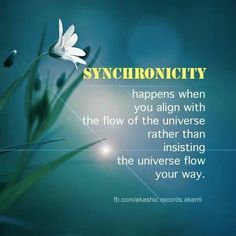 I have read that this term synchronicity is a concept that Carl Jung created that expounds on the idea that events are meaningful coincidences if they occur with no apparent casual relationship yet seem to be meaningfully related. Synchronicity happens when for example you had the perfect day where everything seemingly flow in a precise order and nothing crashed. It seemed that timing was everything and all seemed right with the world. Have you ever had one of those days? Now how do days like that happen? I look at them as small wonders, miracles depending on the breath of the occurrences. It’s wondrous to be on the receiving end of that life event. Synchronicity happens for a reason, whether you believe it’s unseen hands that are moving these events into your path or you are sending out your energy to draw them in , the law of attraction or your intention to make things manifest in your life. You are in the flow and are in the world and are present- tear off the paper and open that gift up and use it and do not waste any moment of it! What was your perfect day? Chris definitely and at times when we seem to be in the midst of stress and pain we miss that. Thanks for the reminder!